Most vehicles with all-wheel drive pay the price in fuel economy. Not the Kia Trail’ster concept that Kia Motors Corp. unveiled Thursday at the Chicago Auto Show. Beneath its outdoorsy styling, which includes a rollback canvas roof and aluminum skid plates on the body of a Soul subcompact, the Trail’ster sports an electric awd system that uses an electric motor to spin the rear wheels. Powered by the electric motor combined with a 1.6-liter turbocharged gasoline engine, the Trail’ster delivers a 25 to 30 percent increase in fuel economy in city driving and a 5 to 10 percent gain in highway driving over an ordinary Kia Soul, the automaker said. It may be a sign of products to come from Hyundai Motor Group as stricter fuel economy rules take effect around the world. 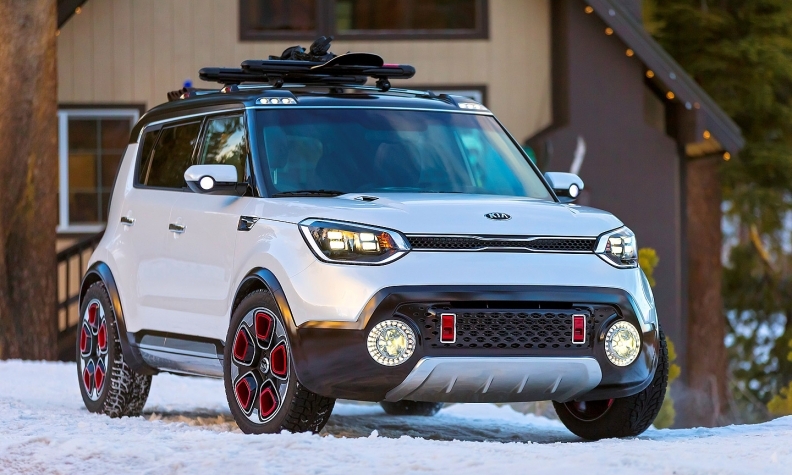 Though such a setup would cost more than an ordinary powertrain, Tom Kearns, chief designer at Kia’s California design studio, said in a statement that the Trail’ster’s electric awd system is a no-compromises design that offers performance and efficiency. “This is awd being done the advanced, intelligent and responsible way, while sacrificing nothing,” Kearns said. The Trail’ster uses a “through the road” hybrid system, meaning the gasoline engine and electric motor are coordinated by computers but are not physically connected. The 1.2-kilowatt-hour lithium ion battery and 27-kilowatt motor deliver torque in low-speed driving, aid with traction and recover energy through regenerative braking. The electrified rear wheels get 35 hp and 100 pounds-feet of torque, combining with the gasoline engine under the hood for a total of 220 hp and 285-pounds feet of torque. With its playful design, the Trail’ster follows the drop-top Soul’ster concept from the 2009 Detroit auto show and the speedy Track’ster concept from the 2012 Chicago Auto Show. Kia gave no hints about whether it might sell a vehicle like the Trail’ster, other than calling it a “near-future” look at how a production vehicle might be built.